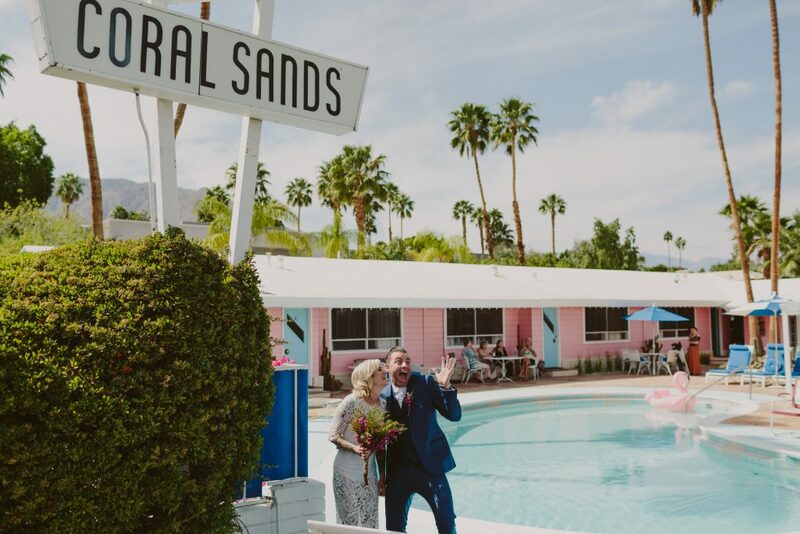 Destination weddings in Palm Springs are a wonderful way for soon-to-be brides to break away from that winter weather (November-March) and escape into some sunshine! 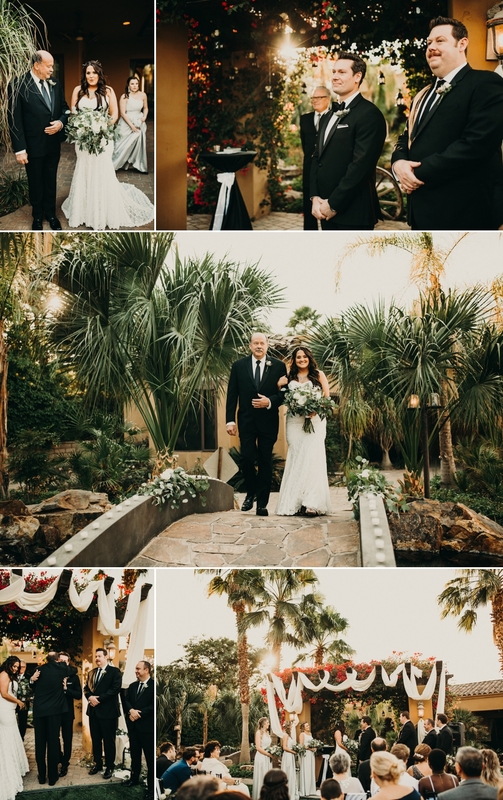 That is exactly what Gabrian & Stephanie did when they left the frigid December temperatures of Colorado for a destination wedding at Laguna Seca Estates. 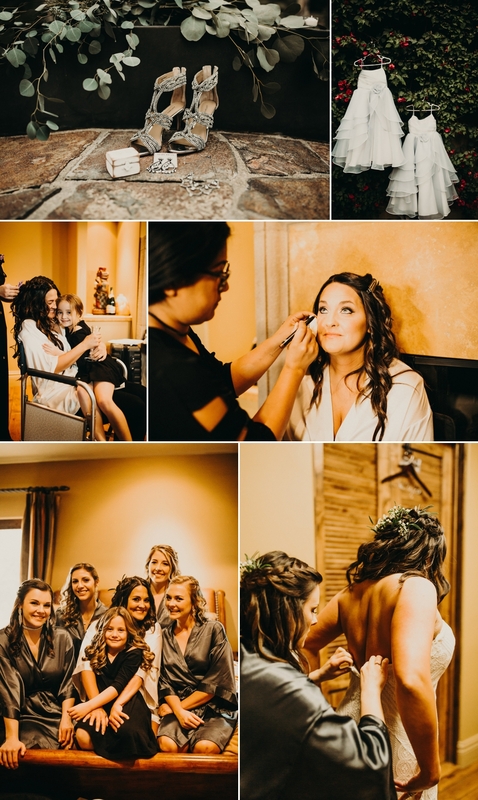 This couple’s intimate wedding at Laguna Seca Estates had good time, a sparkler exit and to top it all off twin flower girls! 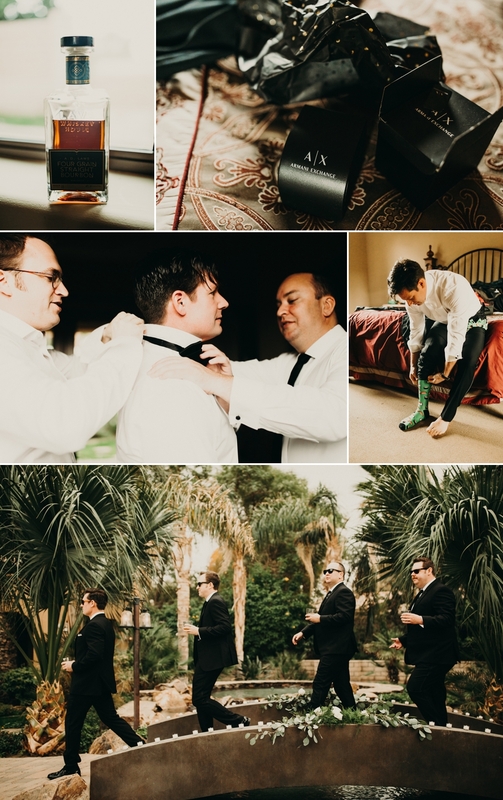 Captured by the talented Grace Gotto, this Palm Springs wedding was certainly a stunner. 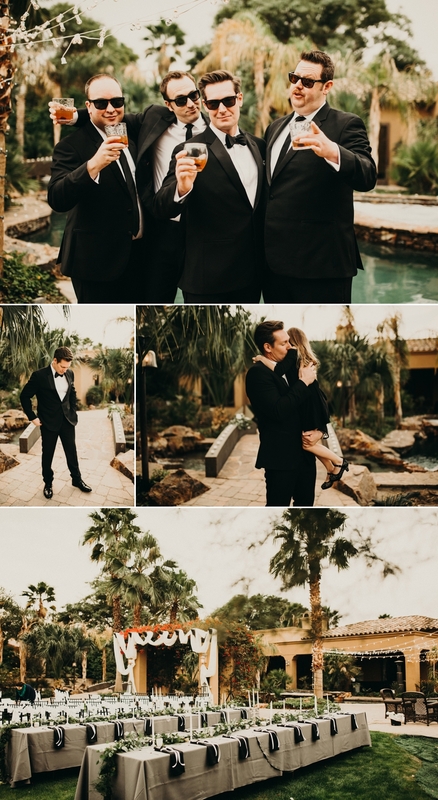 But you don’t need to take our word for it because below are some of the wedding photos at Laguna Seca Estates and words from the bride about her amazing wedding day in Palm Springs, California! Gabe has been friends with my brother for many years, but the two of us never “ran in the same circles”. For some time, I had really wanted to hang out with Gabe as I just had this feeling we would really click. One of our mutual friends was getting married, and I expected that Gabe would be at the wedding so I thought it would be the perfect opportunity to see him. Much to my disappointment, he wasn’t there as he was in the middle of nursing school and was busy studying. After a couple glasses of wine, I got up the courage to message him about how I was bummed he wasn’t at the wedding. We decided to meet at a brewery the following week, and the rest is history! So happy I took a chance and made the first move haha 😉 The way we met is just ordinary, but our love is extraordinary. Being loved by him is the best thing in the entire world. The first time he ever kissed me was after we spent an evening with our friends at a Irish pub. It was outside under the twinkle lights strung from the trees and it started to rain. Think kissing in the rain, like the scene from The Notebook status. Magical. Fast forward a year, and he told me that we were going on a double date with his brother and sister in law. He pulled up next to the spot where he first kissed me and parked the car. I got out thinking we were just walking down the sidewalk to the restaurant we had reservations at…instead of continuing to walk, he got down on one knee and asked me to spend my life with him in the same spot where he first kissed me. After I said YES, he informed me that all of our family and friends were waiting for us and he took me across the street to the Irish pub. When we walked in the entire restaurant started cheering for us. And then we all drank whiskey. And it was just the BEST. We live in Colorado along with most of our friends and family. However, we didn’t want to have a winter wedding, so we started looking into the possibility of doing a destination wedding somewhere warm in December. 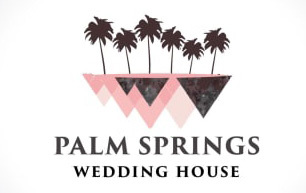 I searched many different locations from Florida to Cancun and finally settled on Laguna Seca Estates in Palm Springs. Quick and easy flights for our friends, and the climate is just unreal at that time of the year. 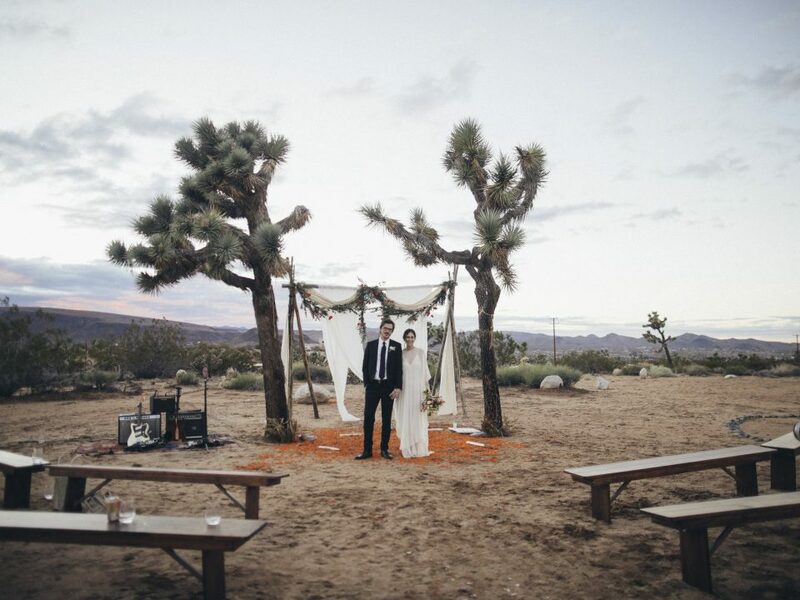 Not to mention, it is so beautiful and just a dream come true as a wedding destination. 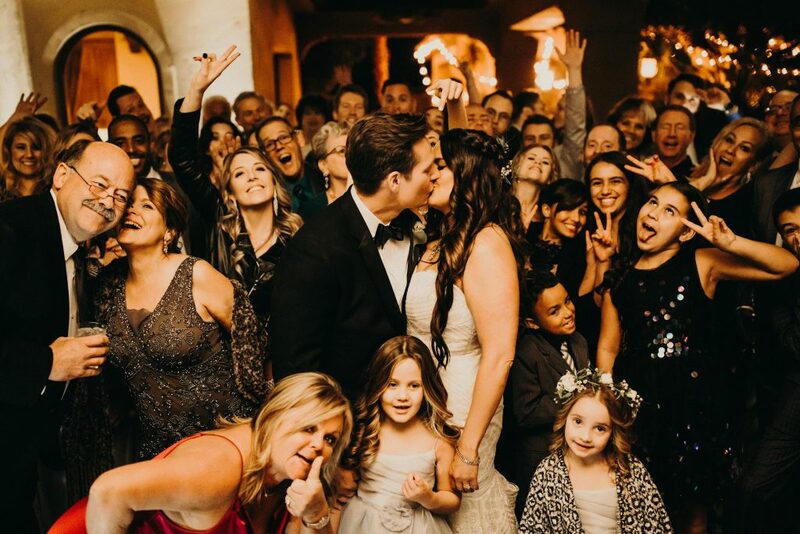 Our vision for our wedding was to keep it small and intimate and to make it a weekend long celebration with our closest friends and family. We decided to rent two private estates where we could hold all of the festivities, as well as provide our family with a place to stay. We wanted our guests to feel like it was a fun weekend getaway. 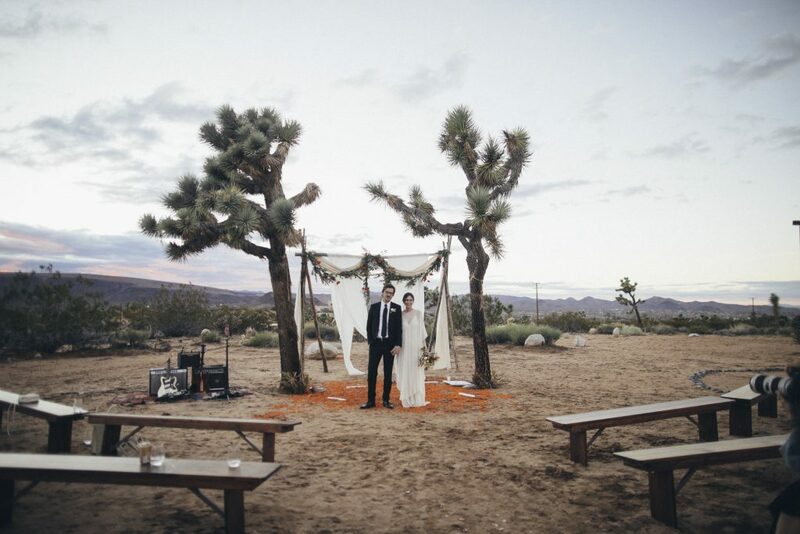 It was breathtaking and the most perfect spot for what we envisioned. 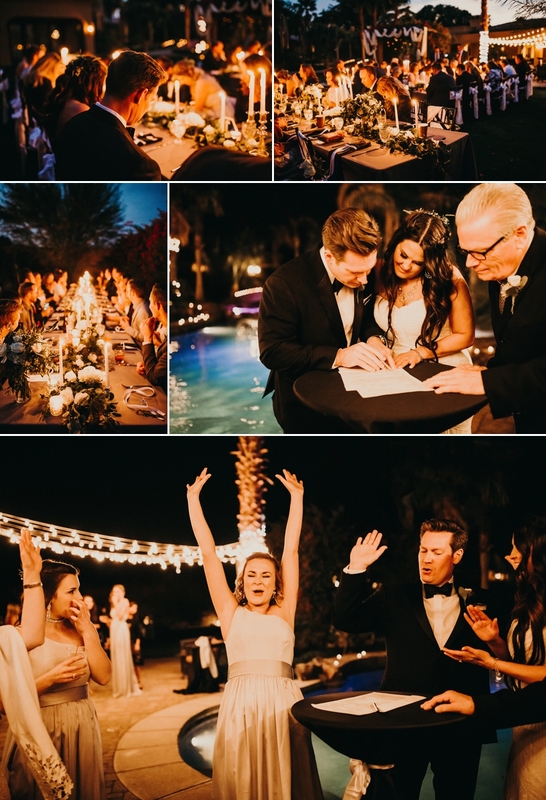 We celebrated with a pool party on Friday, the wedding ceremony and reception on Saturday, and a brunch on Sunday along with a lot of partying in between. Everything was just perfect. It was a short faith-based ceremony with a ring exchange and vows, but what made it the most special was that Gabe’s father married us and my 6 year- old twin little girls got to be our flower girls and witness the joining together of their mom and new dad which they had long awaited. My husband was my favorite detail! It was just the happiest of weekends. So much smiling, love and laughter filled the entire weekend. It was just so fun!!! What more could you hope for?! Everyone had a blast and that is what was very important to us in planning it! 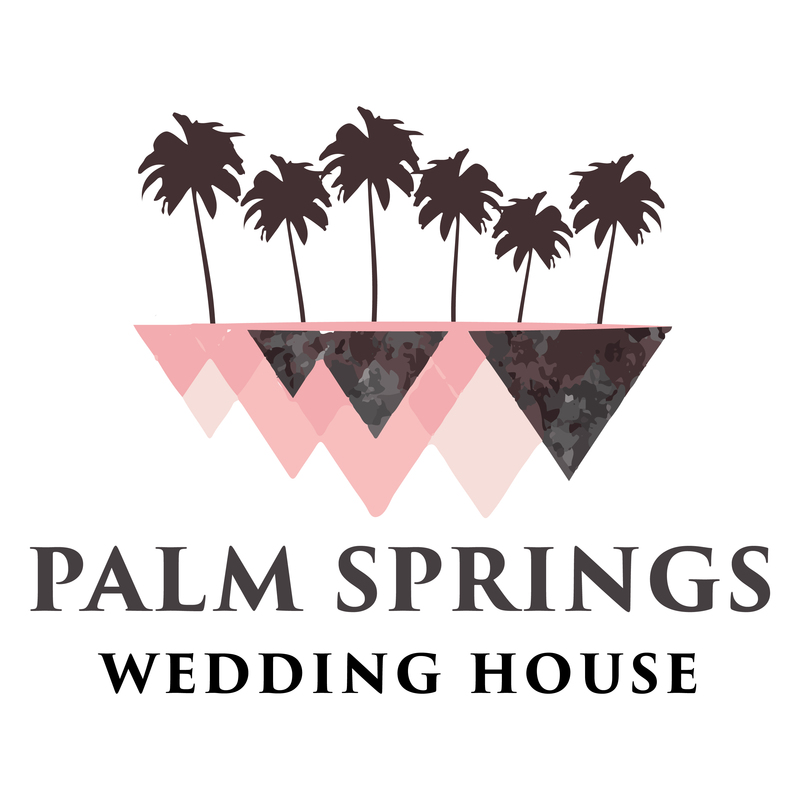 The setting was just incredible – gorgeous grounds with a stunning pool and tall palm trees made for the most perfect wedding setting. 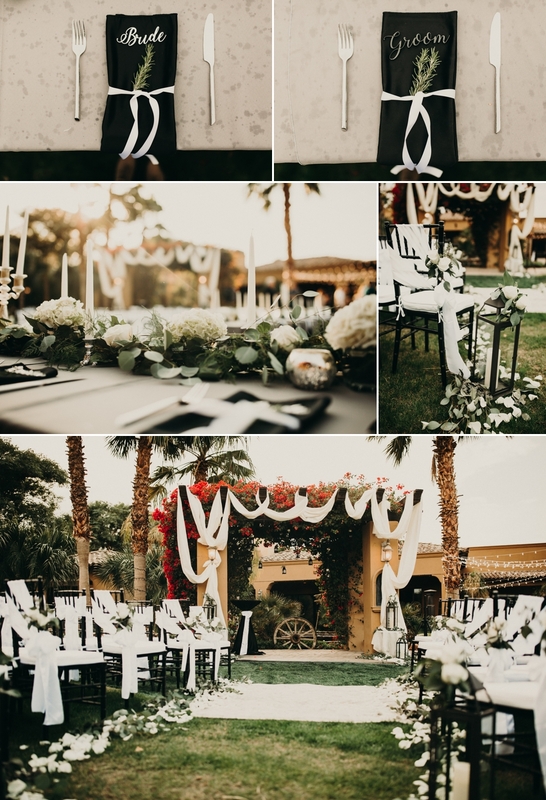 Eating dinner under the stars by endless amounts of candlelight and string lights was unforgettable. The dozens of fresh flowers were just incredible. The private chef who cooked all weekend. Having tacos and margs as our wedding menu, because let’s be real, who wants plated chicken?! The sparkler sendoff was magical. Every detail was perfection. It was everything we dreamed it to be and more. 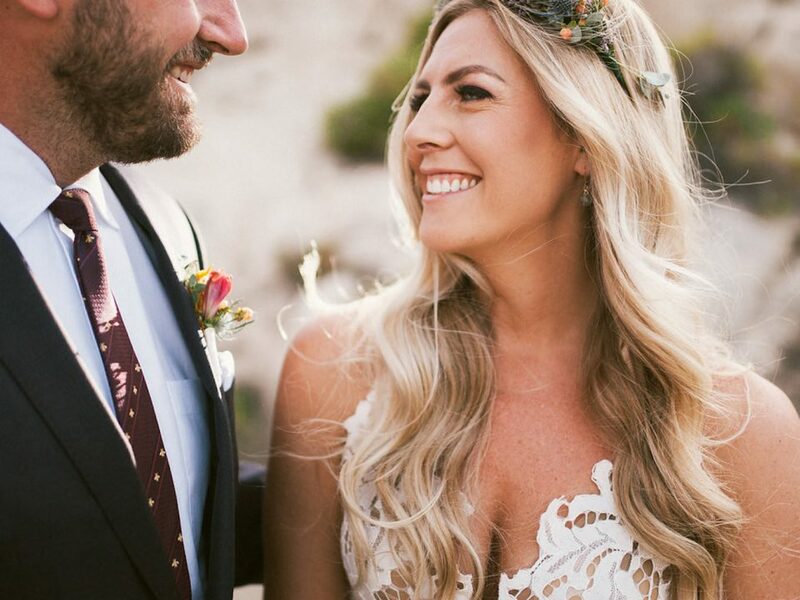 For us the only real challenge was trying to plan a wedding in a town you’re aren’t familiar with and not knowing the local vendors and picking out a wedding venue (Laguna Seca Estates) that we never saw in person until we arrived for our wedding weekend. Therefore, I tried to be as prepared and as organized as possible leading up the big day so that I would be able to enjoy myself and spend as much time as possible with our loved ones. 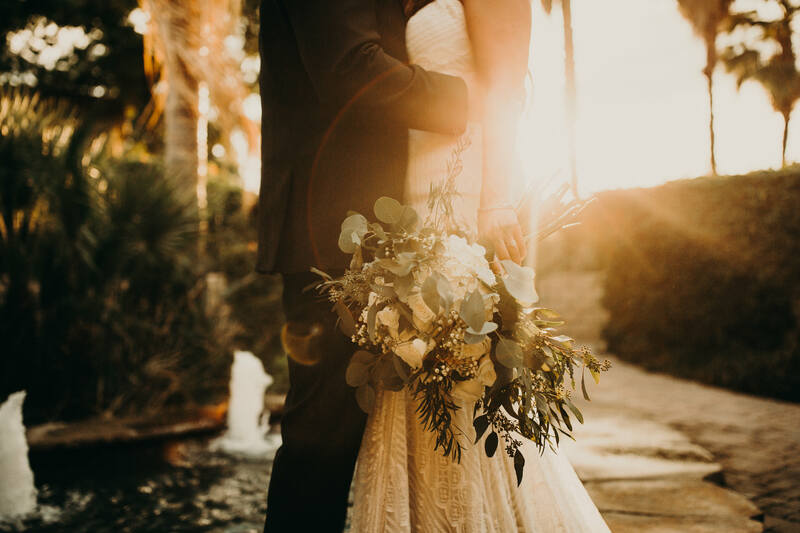 Wedding days really are a whirlwind and they go by so fast, so my advice to any bride would be to take a breath, soak in every little moment and enjoy the ride! We had a fantastic DJ come down from Vegas and he KILLED it! And yes, splurge on the right lighting for the dance floor – it makes a huge difference and set the ambiance for the best dance party. My groom had the idea that he wanted to surprise everyone with our first dance – so we did a portion of the choreographed dance from Dirty Dancing with everyone at the wedding circled around us and cheering!!!!!!!!!!!!! It was a hit and so much fun!! Then we went into our “real first dance”. 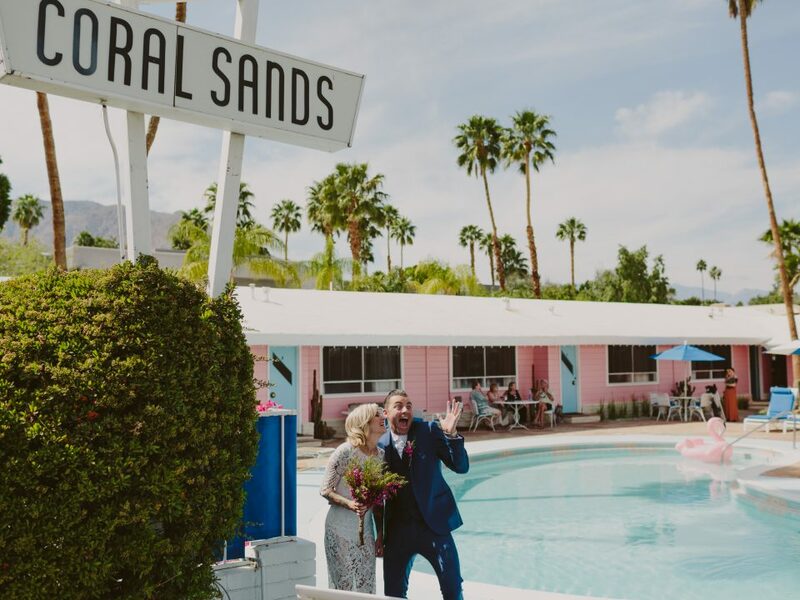 My favorite moment from the Palm Springs destination wedding had to be saying I DO and walking down the aisle as husband and wife!!!! Nothing beats that feeling! I literally had the world’s best wedding dream team. 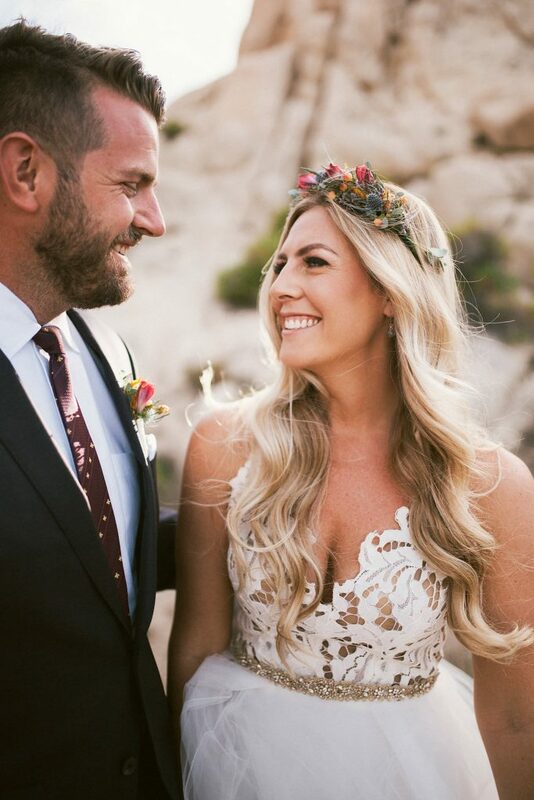 Saying thank you could never fully express our gratitude for their work to make our destination wedding at Laguna Seca Estates. Thank you, thank you for everything!! !